If you or a loved on in Southern California has suffered from a throat injury due to someone’s negligence contact me today for a free consultation. I am a Los Angeles Personal Injury Lawyer who has recovered millions for my clients. Throat injuries are very serious injuries which can be serious or fatal. There are 2 basic categories of injury here: blunt or penetrative. Blunt throat injuries: There are any numbers of ways which one can have a blunt throat injury. Generally this involves a direct blow to the front of one’s neck and can cause serious injury to the windpipe, voice box, cervical spine, esophagus or some combination thereof. Penetrating neck traumas: Representing about 5 – 10% of traumatic injuries the ER receives, penetrating neck traumas are when something has penetrated the throat. This involves broken skin. These injuries sometimes involve damage to the airway, vascular structures, spinal column, spinal cord, trachea, esophagus, nerves and other important structures. How do throat injuries occur? Blunt throat injuries occur in a variety of ways such as car accidents, sports injuries, strangulation, physical altercations, and slip and fall accidents. 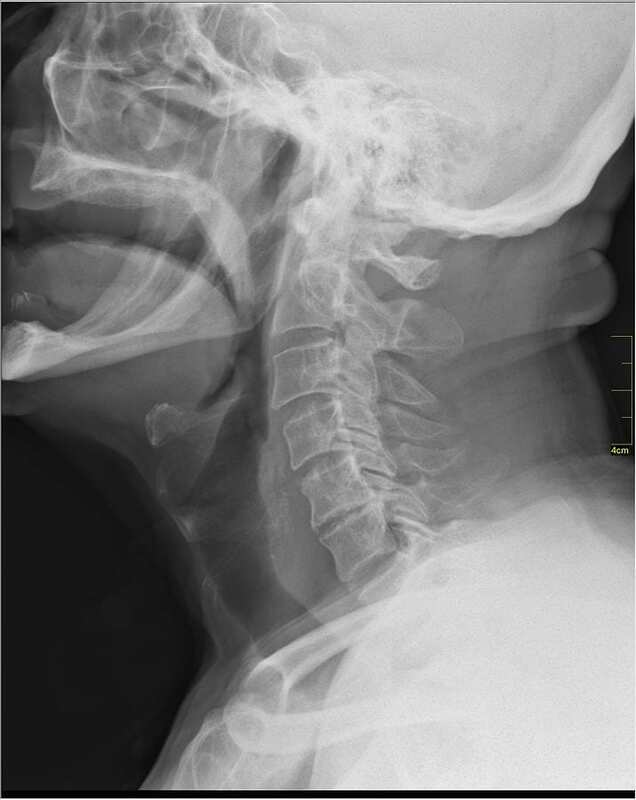 Penetrating neck injuries occur by car accidents, stabbings, or by other accidents which penetrate the neck. Symptoms vary drastically depending on the type of injury. Of course, anyone who has sustained a traumatic injury to the throat should seek medical attention immediately. That said, some symptoms of throat injuries include: Shortness of breath, rapid breathing, coughing up blood, bleeding, severe bleeding, coughing, swelling of the throat, lack of movement around the larynx, difficulty swallowing, and hoarseness. As stated above a throat injury needs to be treated by medical professionals immediately. For example, if you were involved in a car accident, call 911. People with potential throat issues are often instructed by 911 operators to hold still until EMTs arrive. People suffering from minor throat injuries may find help with WebMD’s throat injury home treatment. Image credit: “Medical X-Ray imaging EJE04 nevit” by © Nevit Dilmen. Licensed under CC BY-SA 3.0 via Commons.